Bath’s independent businesses are being celebrated for the first time in a new promotional campaign by the city’s destination marketing organisation. Called Independent Bath and staged by Visit Bath, the campaign is highlighting the diverse range of independent businesses in the city – from food and drink, accommodation, shopping and events. The move is the latest in a series of mini-marketing exercises by Visit Bath concentrating on different aspects of the city’s visitor offering. It will run this month and next. Visit Bath executive chairman Craig Jenkins said: “One of Bath’s ‘pulls’ is that it offers unique shopping, dining and accommodation experiences. 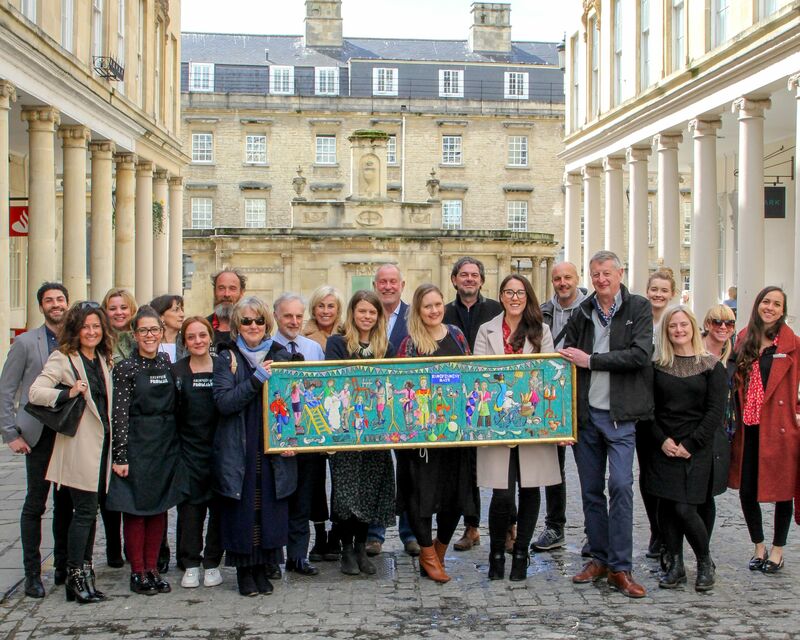 Visit Bath commissioned local artist Jessica Palmer to create an artwork to reflect the independent spirit of the city. Jessica’s creation – which was unveiled at the campaign launch this week at Bath’s 44AD art space, is a fictional representation of individual artisans and makers. The colourful and characterful figures conjure up that ‘special something’ that makes Bath’s independents so appealing. Jessica said: “This project was the perfect opportunity for me to combine design, painting and a touch of collage. The brief asked for a colourful, vibrant image which would spark interest in Bath’s Independents. The artwork will go on tour to some of Bath’s independent shops during the campaign so that residents and visitors can take a closer look. Visit Bath the plans to sell the artwork at the end of May with proceeds going to local independent support group We Get It. Each Visit Bath campaign supports a local good cause and We Get It was chosen for Independent Bath campaign as it is run by a team of local people who have a deep understanding of tackling cancer and now provide much-needed support and information for people in Bath who are dealing with cancer via workshops and meet ups. Patron of We Get It, former journalist and TV presenter Bob Crampton, said: “What makes the newly-formed cancer support group special is that it is run by people who’ve experienced cancer or are still being treated. The organisation offers help to those just diagnosed, patients facing up to life after the NHS care and all those touched by cancer – whether patients themselves or those caring for them. “We run nutritional and exercise regimes – and, most importantly, organise gatherings where patients and former patients can meet in the Bath area.” Food and drink for the launch of Independent Bath were provided by Beckford Bottle Shop and Comptoir + Cuisine.